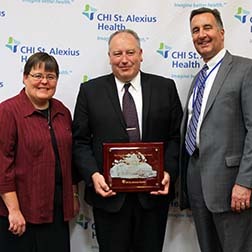 The Sr. Boniface Timmins Award recognizes a person in leadership who emulates the qualities of servant leadership modeled by Sr. Boniface Timmins, administrator of CHI St. Alexius Health for nearly 40 years. She was characterized as an energetic woman, clever and persuasive communicator, skilled at promotion and public relations while being astute with business affairs. Presenting the award to Tod was Sr. Nicole Kunze, OSB, Prioress of Annunciation Monastery and Kurt Schley, CHI St. Alexius Health President.